Montgomery County is the only jurisdiction in the region, and one of a few in the nation, that has a government monopoly on wholesale distribution of all alcoholic beverages. Currently, only county-run liquor stores are allowed to sell spirits, although a recent change in state law will allow the county to contract with private stores for spirits sales. Restaurateurs and retailers have been complaining about selection and service problems at the county’s Department of Liquor Control (DLC) for many years. The monopoly had system-wide delivery failures in the week between Christmas and New Year’s in both 2015 and 2016. It has had numerous instances of corruption, including black-market skimming and drunk driving by employees on the job. A partner in a prominent restaurant chain once referred to the monopoly as an “evil empire.” A co-owner of the now-closed Classics Restaurant in Downtown Silver Spring blamed his decision to shut down in part on the monopoly’s “bloated and antiquated bureaucracy.” And data from the U.S. Census Bureau for 2012 indicates that sales per resident for Montgomery County restaurants were 20% below the regional average and that the county’s restaurant employees per resident were 23% below the regional average. County consumers flee from the monopoly to shop in other jurisdictions. Data from Gallup and the U.S. Department of Health and Human Services link alcohol consumption to income and education. In other words, as income and education levels rise, alcohol consumption tends to rise too. Since MoCo is one of Maryland’s highest-income and best-educated jurisdictions, the county should be one of its leaders in alcohol consumption. However, that is not reflected in per capita sales data collected by the Comptroller’s office. In terms of per capita sales deliveries to retail licensees inside each Maryland county, MoCo ranks 14th of 24 jurisdictions in wine, 23rd in spirits and dead last (by far) in beer. Among the counties out-ranking MoCo in per capita wine sales are Calvert, Carroll, Cecil, Garrett, Harford and Kent, all mostly rural jurisdictions with far less disposable income than MoCo. The District of Columbia may be the biggest beneficiary of Montgomery’s liquor monopoly. 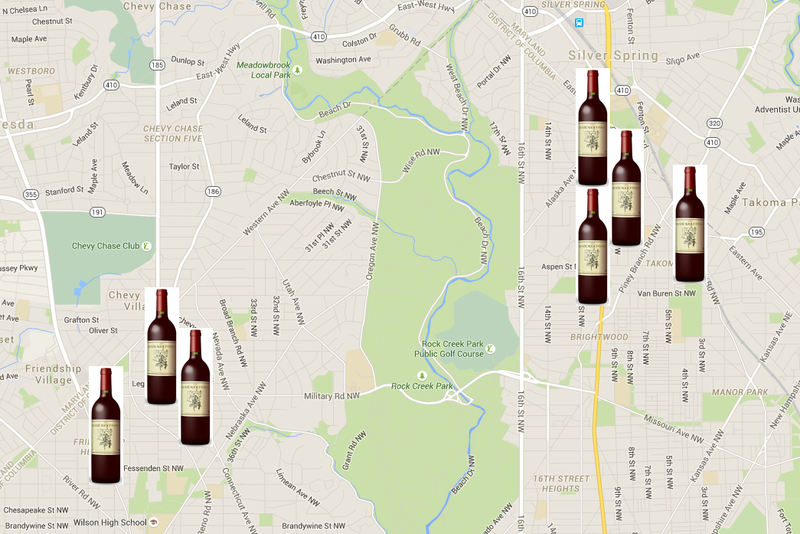 Seven liquor stores in D.C. are located within four blocks of the county border. The liquor monopoly earns roughly $30 million annually, of which about a third is used to pay off bonds. Monopoly profits accounted for 0.4% of the county’s operating revenues last year. The County Executive’s spokesman once predicted that any loss of the county’s liquor profits would cause a big property tax hike but the county raised property taxes by 9% anyway. This same spokesman then characterized a $120 million budget shortfall as “pretty small.” Advocates for ending the monopoly presented a plan to recover any lost liquor money but it was ignored by county government. The liquor monopoly is not just a problem for restaurateurs, retailers and consumers – it is an economic development impediment for Montgomery County. ThinkFoodGroup CEO Rob Wilder said in 2015, “It is our belief that the control of all alcohol at the county level has over time resulted in a lower quality dining service in MoCo, lower expectations and the loss of great businesses, commerce and tax revenues to our competitors—specifically the District… Where are the young and up-and-coming chefs in Bethesda? Where are the entrepreneurial culinary trend-setters in MoCo?” It’s time for us to join the 21st Century and compete with the rest of our region for jobs and business. We want to know what you think about Montgomery County’s jobs market. Click here to share your comments with us.